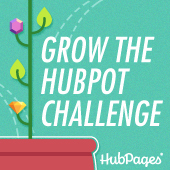 The New HubPages Challenge: Grow the HubPot! Hello Hubbers! A lot has been going on at HubPages Headquarters, and we have been deciding on our overall goals for 2014. In 2013 our main goal was to improve quality on HubPages and, with your help, we think it’s been a great success. Our overriding goal for 2014 is to grow high-quality Hubs. Ultimately, we would love to see 200 outstanding Hubs a day! We measure outstanding quality using our Writing Scale’s example of an 8 or better. As a community and a team, we feel like this goal is the key to the survival of HubPages. Are you in? We think we can do it; if we can’t, then nobody can because you are part of the most amazing community out there! The challenge begins Monday, February 24th at 12:01 am PT (midnight) and ends on the following Sunday evening, 11:59 pm PT (midnight). Hubbers can only have one Featured Hub per day that counts toward the contest across all of their HubPages accounts. The Hub that counts toward the contest is the first Hub published that day, so be sure that the first one you publish each day is your very best. We will update you by 2pm Monday through Friday on the finalists, winners, and the Grand Prize HubPot numbers! To read more about the rules of the challenge, please see our official guidelines. The Grow the HubPot Challenge will begin next Monday morning! We hope that this provides an incentive to start writing those fabulous Hubs! Our goal is to have 200 high-quality Hubs produced a day and to have Hubbers work as a team to grow the HubPot! Good luck! Are hubs on all topics considered, or will you follow the HOTD protocol and favor hubs about food, history, crafts, and personal emotional development? Hubs on all topics are considered for both the Grow the HubPot Challenge and Hubs of the Day. Another great idea for Hubbers. Thanks for making the upcoming year something to look forward too. Incentives like these is where great ideas and terrific Hubs come from. What a great idea to stir up the old motivational pot! How long will you be running this contest? We’ll be running this contest for a week, (Monday the 24th until Monday the 3rd). Can the hubs be “in the queue,” i.e., pre-written, but never yet published in order to qualify? I’ve several hubs I’ve started, but various personal issues intruded upon my getting them finished and published. Does the ‘changed..’ date, (which is when I first began work on that hub), preempt the ‘published on’ date? May I please submit my work. I been working on it before the contest began & forgot to submit it before yesterday’s deadline. Can I still participate? I did not add my article to hubpages yet, may I still do so or is it too late? The contest is going on all week, so you just need to publish a Featured Hub sometime before next Monday (the 3rd). Where will the daily and final winners be published? I’ve published two hubs in two days, enjoying this challenge. I’m a little late here, but am interested in trying to participate with a new hub during this month of March. If I am correct, there is no particular link to publish the hub on, other than our own site? I also understand that this is only for NEW hubs, not formerly featured hubs, correct?